Syfy’s confirmed they will be presenting panels at the 2018 New York Comic Con for new shows Nightflyers and Deadly Class as well as returning series Happy!. In addition, Syfy Wire has been named this year’s official streaming partner and will be broadcasting live from the NYCC during its four day run, October 4 through October 7. Among the stars and producers expected to attend the New York Comic Con are Nightflyers‘ David Ajala, Eoin Macken, Gretchen Mol, David Bartis, Jeff Buhler, and Gene Klein. Happy!‘s jam-packed panel will include Christopher Meloni, Ritchie Coster, Patrick Fischler, Chris Fitzgerald, Lili Mirojnick, Medina Senghore, Patrick MacManus, Grant Morrison, and Brian Taylor. Deadly Class is also expected to have cast members in attendance at the NYCC. Experience the terror with an exclusive world premiere screening of the highly-anticipated SYFY series, Nightflyers, based on the novella by George R.R. Martin. Set in the year 2093, the series follows a group of maverick scientists and a powerful telepath as they embark on an expedition aboard The Nightflyer – the most advanced ship ever built. As they race towards first contact, terrifying and violent events begin to occur, causing the once tight-knit crew to mistrust each other. It’s not long before their main mission becomes survival. Unlike anything you’ve seen before, Nightflyers combines horror and science fiction in a way that Martin himself has described as “Psycho in space.” Following the screening, an exclusive Q&A session with the cast and creators follows. Join the cast and creators of SYFY’s hit series as they look back on the insanity of Season 1 and tease the even crazier second season. Based on the graphic novel of the same name by New York Times best-selling author Grant Morrison and Darick Robertson, Happy! 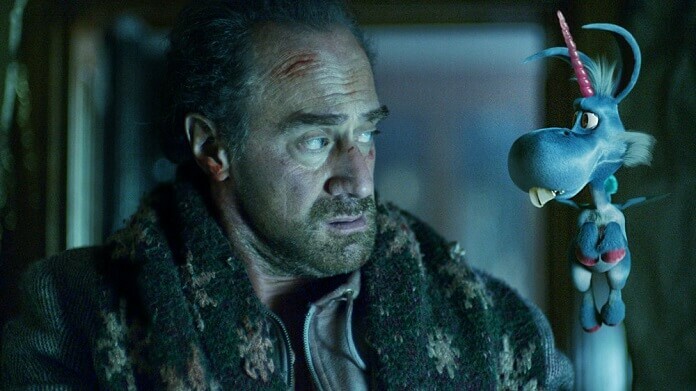 follows Nick Sax (Christopher Meloni), an intoxicated, corrupt ex-cop turned hit man whose life is forever changed by his new partner-in-crime – a tiny, relentlessly positive, imaginary, blue winged horse named “Happy” (voiced by Patton Oswalt). Be the first to see the premiere episode of the highly anticipated new SYFY series, Deadly Class, based on the hit graphic novel by Rick Remender and Wes Craig. Executive produced by the Russo Brothers (Avengers: Infinity War), Deadly Class follows the story of Marcus, a teen living on the streets who is recruited into Kings Dominion, an elite private academy where the world’s top crime families send their next generations to learn the deadly arts. After the screening, join the cast and creators for an exclusive Q&A. What superfan doesn’t love a good debate? Who’s coming back from the Snapture? Reboot or remake? Shared universe or stand-alone? Join celebrity favorites from the sci-fi universe for the ultimate debate as they share their thoughts, feelings and theories on the genre’s most hotly contested topics while our moderator keeps the peace. After each round, you’ll get to settle the debate by casting your vote for the most convincing argument.